The S&P 500 is marching, with nary a worry, to the beats of technical patterns. It is approaching the upper limit of a regression channel (78 months and 0.5 standard deviation) on monthly chart (see Fig. C). From February to September 2017, the index moved up along the linear regression line. Earlier attempts to reach the upper limit line – in 2010, 2011 and 2015 – resulted in either a sideways move or a short decline and reversion to the mean, just saying. The 14-period RSI has been rising after making a double bottom near 50 in February 2016. It crossed above 70, the overbought territory, in February 2017. In December 2017, it reached 84.23, a overbought reading that was previously reached in February 1996 and July 21997. Both times the index continued moving up. 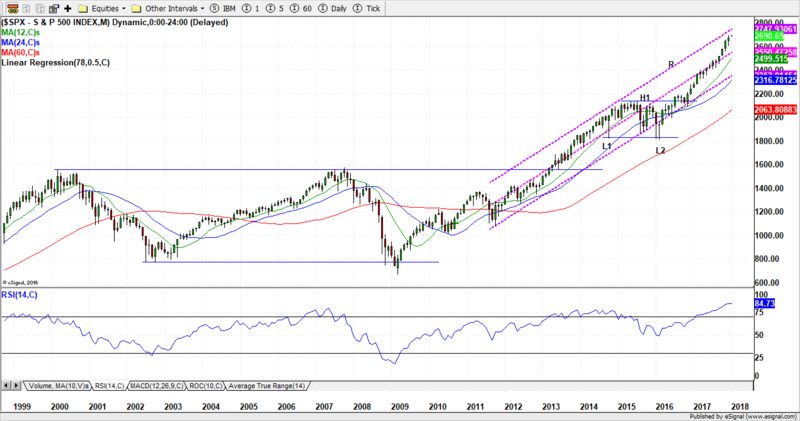 S&P 500 made a low of 1820.66 in October 2014 (L1 in Fig. A) and a low of 1810.10 in February 2016 (L2 in Fig. A). The lows are quite close and form a double bottom. In May 2015, the index made a high of 2134.72 (H1 in Fig. A). In July 2016, it tried to break above the intermediate high point. The index struggled to stay above it for three months before falling below it in October. It broke above the high again in November completing the double bottom pattern. The height of the pattern is 324.62 and the breakout point is 2134.72. The 100% extension target is near 2459.34 which is near the target from the rectangle chart pattern. The S&P 500 is still on an ever extending up move. Between 1996 and 2013, markets had two major melt-downs and two major tops. These reversal points formed a nice looking rectangle trading box for the S&P 500. 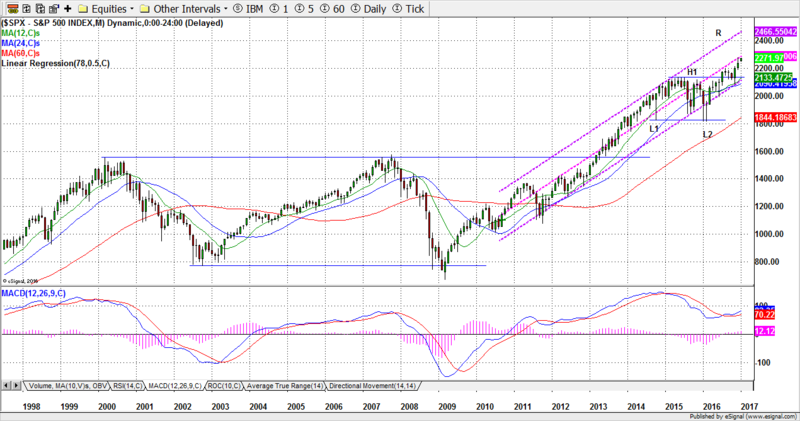 The upper limit is bounded by the highs of 1553.11 and 1576.09 reached in March 2000 and October 2007 respectively. The lower limit is bounded by the lows of 768.77 and 666.79 reached in October 2002 and March 2009. The index broke above this rectangle in March 2013. Since then it has been on an upward trend. The height of the box is roughly 909 points (from highest to lowest). The measured target of this patterns using Fibonacci levels are: (i) 61.8% extension target near 2138.04; (ii) 100% extension target is near 2485.39; and (iii) 161.8% extension target near 3047.34. The 2015 high was 2134.72 reached in May, which corresponds with 61.8% extension of the rectangle trading box and 161.8% extension of the ABCD pattern. The index took more than thirteen months to break above this level. The next target in play is 3047.34, which is close to 40% above the current level. The annual rate if change for S&P 500 since 1971 has been approximately 7.13%. Using this average, it will take S&P 500 five years to reach 3047.34. The two major downturns in the index also coincided with the cross-over of 12-months and 24-months moving averages. 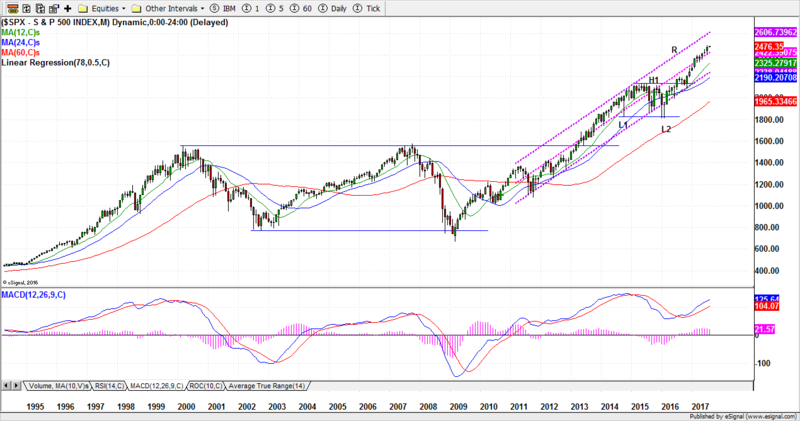 In April 2001 and July 2008, the 12-month MA crossed below 24-month MA. Both averages and the price was already falling before this cross over. In May 2016, the 12-month MA crossed below 24-month MA. In July it again crossed above the slow MA. However, the price and the 24-month MA were rising when the first cross over occurred. Also, in 2000 and 2007, the 9-period RSI was above 70 and making a diverging from the price. So far this time the RSI has not crossed above the overbought levels.